It’s official. The Daleks are the supreme rulers of the universe. In a survey carried out by Doctor Who Adventures, the screeching monsters came top of our 2008 monster poll. The Daleks were closely followed by their creator, Davros. And little fat monsters, the Adipose, came third. Find out what other creatures were in the top five in this week’s Doctor Who Adventures, out now! The issue comes with a free Dalek toy and stickers – and is packed with everything you need to know about Doctor Who. o Three posters! The Doctor, Sarah Jane and her friends, and the deadly Daleks. o Fact file: The Doctor’s daughter, Jenny. o Quiz: Are you like the Tyler or Slitheen family? Find out in our cool quiz. o Tales from the TARDIS: Gas-mask zombies trap the Doctor, Rose and Jack. o Sarah Jane Adventures: Check out our facts about Clyde Langer. 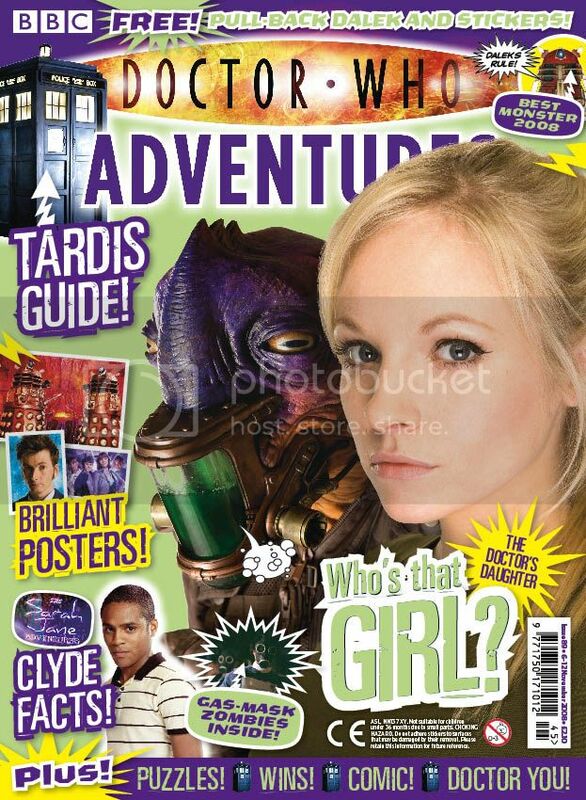 o Ultimate Guide: A pull-out mini mag about the TARDIS. o Comic strip: The Man in the Moon, part 2.
o Win: Great goodies up for grabs. o ALL THIS AND LOTS MORE! Doctor Who Adventures, priced £2.10, is out now. Daleks beware! This entry was posted on November 8, 2008 at 7:32 pm and is filed under Doctor Who Adventures. You can follow any responses to this entry through the RSS 2.0 feed. You can leave a response, or trackback from your own site. If you can make a banner on my site including the 10 doctors plus the new doctor in the NEXT DOCTOR. The SJA gang must be included in the banner as well and if you win then you will have a chance to design post and add thing to DOCTOR WHO AND SARAH JANE ADVENTURES. The compition closes on the 23 of December and if you want you can give it a Christmas sign. It doesn’t have to say the name of the site because who ever wins must have a new site name on the banner and then they will have named the DOCTOR WHO AND SARAH JANE ADVENTURES site. I would like as many enteries as possible so please start making banners and you can enter as many as you like.